As mentioned in my previous post I’ve been working with Justine Pollard to deconstruct her trading methods. Now, as I started to dig a little deeper, I discovered something I’ve never seen before… an unmatched level of transparency! Here’s just a few of her verified results. Between June – Sept 2009, Justine shared all her trades as part of a 4 month teleconference program for her top coaching clients. Now for the first time, outside of her club, she shares the details as part of the Online Trading Mastermind. Click here to download her complete logs and mp3s talking through her trading. The insight you will gain will be well worth it. I’d love to hear what you think. Ps. 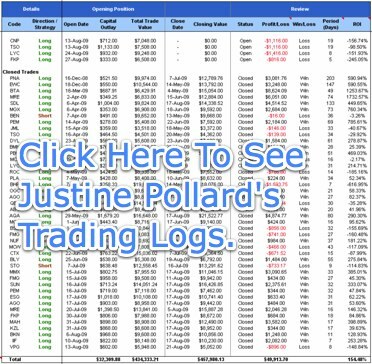 Click the link below to see Justine’s CFD Trading logs. to make money, than it is to actually Make money. category, and I Commend and Thank You. Reading your latest email I came across a quote I just couldn’t let go. And that, my friend, is the place I find myself at the moment. year journey as a retail investor. In order of importance. Taleb’s “The Black Swan” as the final word on this point. INTERMISSION: All smiles so far, but…. 5) Select the TA method that resonates with you. THEN MOST IMPORTANTLY. Bear (OK hang on, for the all the Longs make that a cherished Baby Bull). time on developing a Risk Control strategy than you do a TA strategy. markets – become the best friends, get to know each other well. 7) Read number 5 and 6 again…. were at the time, they were my salvation. Once again David – thank-you for your help (Then and Now) on my journey. Company specific risk, now just Market and/or Sector risk to worry about.